Inspired by the breathtaking scenery of the Wild Pacific Trail: a place where ocean meets forest and whales blow and sing above the stormy weather. 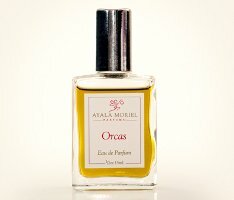 Orcas perfume is an innovative all-natural marine woody, a unique combination of scents from sea and seashore. Brisk and pungent citrus and herbaceous notes suggest ocean breeze and tea-like clarity, and an array of oceanic treasures such as seaweed and ambergris meet seashore and rainforest notes. Notes include ambergris, angelica, blue spruce, clary sage, cypress, geranium, boronia, ginger, lime, rosemary, seaweed, vetiver, violet leaf and cedar. This sounds lovely. Not sure if it would really be “me,” but lovely just the same. Ditto! And like the idea of a seaweed based aquatic. It does sound good. I just wish it didn’t remind me of Dino de Laurentis’ movie. Ohhh, don’t watch it. It’s just a bad movie. Bad, bad, bad. Not even so bad it’s good. I think Richard Harris is in it, which is bizarre, but I guess he needed the money. Cheesy as the movie is, it gave me nightmares as a kid and set me firmly on my animal-lover path. I don’t know…might be worth looking over her blog; I know she has written about the development. Sigh! Now I’m really going to have to try this! Time to send the cats out for part-time jobs! Interesting color choice for an aquatic. Are aquatic scents usually clear or light blue? I suppose, but this is a natural scent…so guessing that’s the natural color of the materials. Sounds really interesting. I would like to try it. Definitely brings back memories of the beaches in Washington State and British Columbia, so I’m definitely going to have to try this! This sounds utterly fabulous, so promising – the sort of scent that would send me on a daydream to a lonely beach of endless sand (or pebbles…. possibly pebbles…) with wind-whipped water and seagulls wheeling overhead. Oh, man, I’ll be taking a closer look at this one. Love the notes and If it can possibly evoke the islands of Puget SoundI have to have it!